Yep, I did not jump for joy or do a pregnant cartwheel when I saw those two little dots on my ultrasound. If I’m being honest, I was scared. Very, very scared to be exact. You don’t know what to feel when you get news like that. It’s just not what anyone expects when they go to get an ultrasound to confirm that they are actually, in fact, preggo. As the weeks went by, I started worrying about raising them too, especially in a financial sense. In my typical Type A fashion, I’d already started a baby savings fund even before I was pregnant. My goal was to save $10,000 before I had a baby, and I already saved a few thousand dollars by the time I saw those double lines on the pregnancy test. Now that I was having two babies, though, I had no idea how to estimate the cost. Would I need to save even more money than I initially thought? How expensive were the hospital bills going to be? What would I do about childcare now that there were two babies involved? And then, it hit me like a ton of bricks: College. Oh my gosh, I have to pay for college tuition for two kids at once. What am I going to do? Translation: College tuition is increasing every year, and according to a recent Allianz tuition insurance survey, 84% of parents already think the cost of tuition is too high. 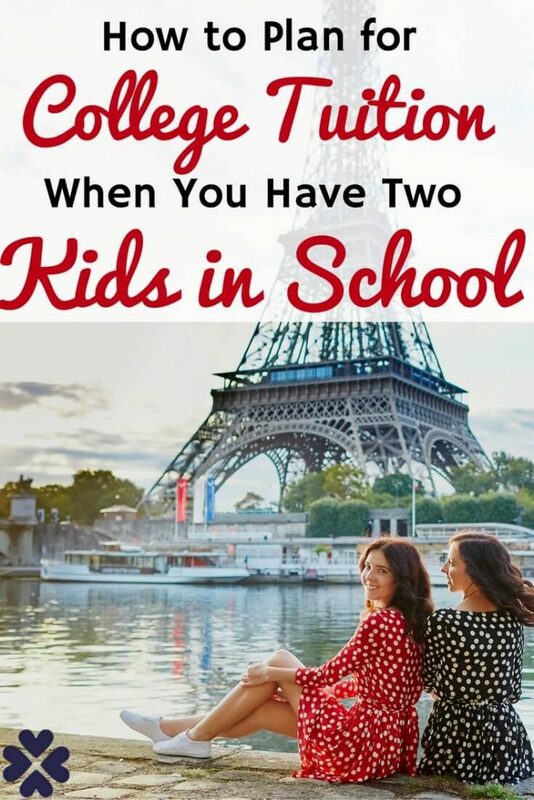 So, you can only imagine how much tuition my husband and I will have to pay to send two children to college at the same time 16 years from now. I’m actually scared to even calculate what it could be. I just read a 2012 Bloomberg article that said that between 1978 and 2012, college tuition and fees increased a whopping 1,120%! There’s no doubt about it; college is a big, big business and with unlimited ways to pay for it (hence our nation’s $1 trillion student loan problem) there seems to be no end in sight for how high tuition can go. So, now that I’ve scared the pants off of everyone trying to save for college, let’s talk about what we’re going to do about it because I mean, we all want our kids to succeed and go to college and save the world and all that, right? Before you start a college savings account for your children, it’s important to have a strong hold on your own finances first. I wouldn’t start a college savings account unless you are regularly contributing to your own retirement accounts and have a nice, solid emergency fund. However, if you’re currently paying back your student loans and know how lame it is, think hard about what you can shift and change in your own life so that your kids don’t have to go through that too. One great way to do that is to get started tracking your spending and try to modify it. If you want to track your spending and overall manage your finances better, the tool I recommend is Personal Capital. It’s totally free, and when you sign up, you connect all of your accounts to it and it shows you your overall net worth, your spending patterns, and more. I like it because instead of logging in and checking every account I have, I can just look at Personal Capital and get a quick glance at everything – perfect for busy moms who only have a second to look online before someone is ripping off a diaper and handing it to you #amiright? According to a recent Allianz Tuition Insurance survey, 82% of parents are planning to pay $10,000 or more per year on tuition. So, if you have twins like I do and you hope to send them to a 4 year institution, we’re already talking about quite a bit of money here. A great way to start saving for a college fund is to save any money your kids get when they are little for their birthdays or holidays in a separate account. I have my children’s gift money invested in a basic index fund in a custodial account, but you can set up a 529 account or an Educational Savings account. I use Charles Schwab as my bank for this purpose, and they have a nice way of explaining all the different college accounts and what each one does without the financial mumbo jumbo that makes no sense. You can read more about the difference between those accounts here. I promise it’s a lot easier than it sounds. Once kids get older and know how to spend money on the things they want, you can encourage them to save some, spend some, and invest some for their college education. When you buy a house, you get house insurance. When you buy a car, you get car insurance. College, as we’ve discussed, is ultra, ultra expensive, so you should consider tuition insurance. In the same Allianz survey mentioned earlier, 76% of respondents knew college tuition might not be refundable if their child drops out. It varies between colleges, but most of the time, after the 9 week or 12 week mark, you will not get your tuition money back if your child drops out due to illness or other reasons. This is where tuition insurance comes in. For a small fee, you can get insurance to protect your investment if your child has to leave school due to illness or injury. You can also get coverage for circumstances like withdrawal due to serious mental health issues. The National Alliance on Mental Illness did a survey of students who dropped out of school, and of them 64% of respondents said they were no longer in school due to a mental health related reason. I think all the time about how hard it was to be in college after I personally experienced Hurricane Katrina. Although I didn’t drop out of school, the challenge of dealing with life post-Katrina was mentally draining, and many of my fellow students did leave school for the year after the storm, unable to cope with the trauma that recently happened to them. This is a situation where having tuition insurance would have been especially helpful for families. According to Allianz, more than six in ten financial advisors said they’d recommend that their clients purchase tuition insurance for their children, and nearly eight in ten recommend it for students taking out their own loans for college. Just remember that you have to buy tuition insurance before school begins, so now is the best time to get started. You can learn more and get a quote here. If you’re a parent of younger children and you don’t need tuition insurance just yet, be sure to put it in the back of your mind for a few years from now. Instead, focus on saving aggressively for college by first making sure your own personal finances are in order. Like I said, I like to use Personal Capital to keep track of my money and make sure that we have enough going into saving not only for us but for our twins’ futures too. Have you ever heard of tuition insurance? How many kids do you have? What are your plans for saving for college, or if you already have children in college, how are you financing it? Disclaimer: I am the spokesperson for Allianz Tuition Insurance, and I fully believe in, support, and promote their tuition insurance product. This post was sponsored by Allianz Global Assistance (AGA Service Company), and my biz, www.CatherineAlford.com, received financial compensation for it. All opinions and mad love for Allianz come straight from me. I agree college tuition for our children is a scary proposition. We don’t have twins, but they are close in age and could easily be in school at the same time. We have a 529 as our state has particularly good tax advantages. I hadn’t thought about tuition insurance, though. I’m curious what qualifies as a serious mental health problem? I’ll have to read more about it. To be honest, the majority of people I knew who dropped out of school were just not ready for college yet. Nice work getting started 16 years ahead of time. It seems like most people don’t start thinking about college costs until their kids start high school. I can’t imagine how overwhelming it must be to be putting multiple kids through college at the same time (in addition to doing multiples of everything on the way there). I have so much respect for parents of multiples. My aunt currently has triplets that just finished their first year in college. They all went to different schools in different places, so in addition to the expected costs, there is also the time cost in moving them all in and out and visiting three different schools in three different cities in two different states. Aw thanks! That’s such a nice comment, and kudos to your aunt. I couldn’t imagine triplets! For what it’s worth, we are planning to pay for about half our children’s college tuition costs. But we are not enamored with the benefits of a 529 plan. I just don’t see there being huge upside: no tax deferrment, and only avoiding tax on the growth. Presuming that you’re investing in tax efficient investments (index stock funds) then what’s the point of locking yourself into the regulations/requirements. Of course, bond funds are the rub, and you’d probably want to include some of them as kids approach college age. With this situation and income I and my husband get each month, I think it would be difficult for us to send our kids to school. That’s why we are planning to save as much as we can and invest in an educational plan so that by the time our kids enter college, we’re completely prepared for the expenses. And, I just hope that my kids would pass for any college scholarships to lessen expenses. Among all the good advice Cat I had no idea there is tuition insurance. An interesting concept. And given your experience of Katrina, it’s no wonder you know about it. Thanks for pointing this out. When I started working with Cat, I had no idea that I’d be able to build my business enough to quit my job in only 12 months. Now I enjoy working from home on my own projects, with my own schedule, and at my own pace. Without Cat’s help I’d still be stuck in a career I didn’t enjoy.